I was speaking with a friend about the financial markets’ moves in 2016. As is usually the case, the market didn’t go quite as most thought it would. We started off the roller-coaster year with a big China-inspired sell-off that lasted through mid-February. Then we rebounded robustly from mid-February though late June. That late-June swoon came courtesy of the surprise U.K. “Brexit” vote to leave the European Union. That vote marked the first of the outlier populist rebellions that occurred during this most-unusual political year. Yet despite the immediate selling reaction to the U.K. vote, markets recovered quickly after Brexit on the notion that global central banks would keep the money spigot wide open as far as the eye could see. That thought helped fuel the rally through the summer. As Election Day here at home drew closer, stocks started to sell off, as the smart money went into defense mode. Then we had the U.S. presidential election vote that shocked the world, and the financial markets. The election of Donald J. Trump as the 45th president of the United States was perhaps the greatest political upset in history. Yet far from causing stocks to crater (as so many so-called experts had predicted), stocks soared on renewed optimism. That optimism fueled equities to multiple all-time highs in December. Though the Dow fell short of that psychologically significant 20,000 mark this year, the post-election move on the “Trump bump” gives me a lot of hope for the markets in 2017. Of course, the hope that President Trump and a Republican Congress will be able to implement a pro-growth, lower-tax, reduced-regulation and fiscal stimulus agenda will have to be met with some actual progress on this front. And, we won’t really start seeing that until the first couple of months of the administration at the earliest. Still, Wall Street is optimistic about a return of American economic strength, and that renewed optimism is something that is likely to keep driving stocks higher in the year ahead. Of course, we’ve seen this year that the market likes to prove even the best analysis wrong. 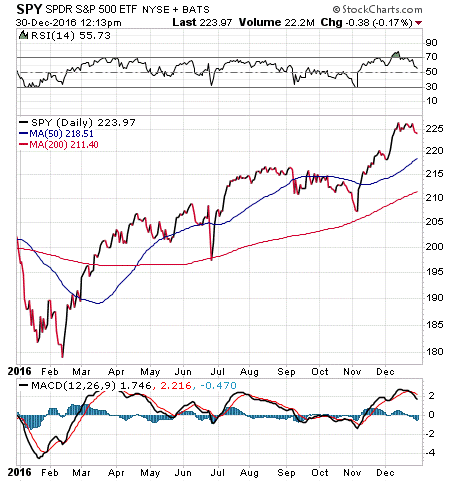 Exclusive Are We on the Verge of a Market Crash? That means we think stocks can continue to move higher while riding the optimism wave. However, we are ready with a trend-following plan in place that will help us decide when to get off that wave if the optimism washes out and if it doesn’t translate into real-world gains. If you’d like to put the power of this proven plan in place for your investments — one that has worked for nearly four decades — then I invite you to check out Successful ETF Investing right now. In 2017, you deserve the best-laid plans… and that is what you get with Successful ETF Investing. It is the holiday season, and I hope your celebration is replete with the joy of giving and receiving gifts to and from friends and family. Now, I’m big on giving gifts that keep on giving, meaning I like giving and receiving gifts of knowledge. This year, I have a few holiday presents that you can give yourself and your loved ones that you may not have thought about, but that are sure to serve you well in the year ahead. The gifts I’m talking about today are the gifts of financial preparedness in 2017. The way I see it, there are several presents you can give yourself right now that can help you become financially prepared for the year ahead. These presents are the best kind because they A) don’t cost you any money, and B) they each represent tools in your investment arsenal that you can use for years and years. Here are three great holiday presents you can give yourself right now. 1) Cultivate a positive and winning attitude. By far the biggest present you can give yourself and your friends and family this year is to approach all aspects of your life with a positive attitude. While this may sound simple, it’s far from easy, especially when it comes to your approach to investing. What you must remember is that there will be ups and downs in markets, bullish periods and bearish periods for stocks, and bullish and bearish periods for different market sectors and various asset classes. Yet, thanks to the tremendous growth of exchange-traded fund (ETFs) over the past several years, it’s easy to get invested in the segments and asset classes that are outpacing their peers. Having a positive and winning attitude means you are willing to accept the opportunities the market gives you, and that you are willing to embrace those opportunities via targeted ETFs. In 2017, that’s what subscribers to the Successful ETF Investing newsletter will be doing, so if you want to see how we go about employing a positive and winning attitude in this service, I invite you to get on board today. 2) Conduct an asset inventory roundup. The second present you can give yourself this holiday season is to do a little financial summary of all of your assets, accounts and financial relationships. This means knowing what assets you own (real estate, stocks, bonds, annuities, mutual funds, 401(k), IRAs, pension plans, etc. ), and especially where those assets are held. This may sound like basic information, but you would be very surprised at how many people I speak with who aren’t sure about where their money is, how it is invested and especially how it should be invested to meet their needs. This present to yourself requires a little bit of time, but I guarantee that will be time well spent — as knowing where your money is and where it is invested is the first necessary step toward allowing yourself the third holiday present on your Christmas list. 3) Make your life easier by consolidating your accounts. Your asset inventory roundup will let you know how many different accounts you have, and how many different financial institutions have portions of your money. Once you do this, you’ll need to start giving yourself the present of making your life easier by consolidating your assets into one or two financial relationships. That means rolling over any former-employer 401(k) accounts into IRAs, or getting out of an old mutual fund company in favor of a discount broker such as Fidelity or Schwab. There is just no good reason to have four, five or more different account statements, or several different brokers, or multiple IRAs or multiple mutual funds at a variety of companies. Consolidating your investment accounts into one, or at most two, companies will simplify your life immensely, and it also will allow you to make smart changes to your holdings that will enhance your chances of success in 2017. So, do yourself a favor this Christmas and start giving yourself these three holiday presents. Doing so will be like having Santa coming in for a visit on a regular basis. If you’d like to find out how you take advantage of the optimism reigning supreme in the markets, check out Successful ETF Investing right now! I’m big on goal setting, as it’s the best way to get your mind oriented toward what you want to accomplish. And what better time than the beginning of a new year to make sure your life is on track to get you where you want to be? So, write your own book, and start this new chapter with some concrete goal setting. I guarantee it will help you find a sense of achievement in 2017. Wisdom about money, investing and life can be found anywhere. If you have a good quote you’d like me to share with your fellow readers, send it to me, along with any comments, questions and suggestions you have about my audio podcast, newsletters, seminars or anything else. Click here to ask Doug. In case you missed it, I encourage you to read my e-letter article from last week about how you can give the gift of financial preparedness this year.